Most insurers around the world have introduced some form of merit-rating in automobile third party liability insurance. 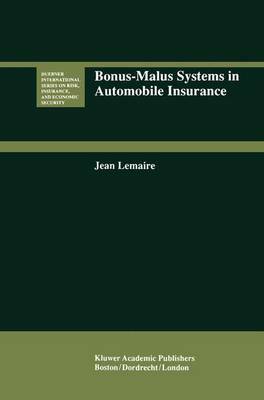 Such systems, penalizing at-fault accidents by premium surcharges and rewarding claim-free years by discounts, are called bonus-malus systems (BMS) in Europe and Asia. With the current deregulation trends that concern most insurance markets around the world, many companies will need to develop their own BMS. The main objective of the book is to provide them models to design BMS that meet their objectives. Part I of the book contains an overall presentation of the pros and cons of merit-rating, a case study and a review of the different probability distributions that can be used to model the number of claims in an automobile portfolio. In Part II, 30 systems from 22 different countries, are evaluated and ranked according to their `toughness' towards policyholders. Four tools are created to evaluate that toughness and provide a tentative classification of all systems. Then, factor analysis is used to aggregate and summarize the data, and provide a final ranking of all systems. Part III is an up-to-date review of all the probability models that have been proposed for the design of an optimal BMS. The application of these models would enable the reader to devise the system that is ideally suited to the behavior of the policyholders of his own insurance company. Finally, Part IV analyses an alternative to BMS; the introduction of a policy with a deductible.